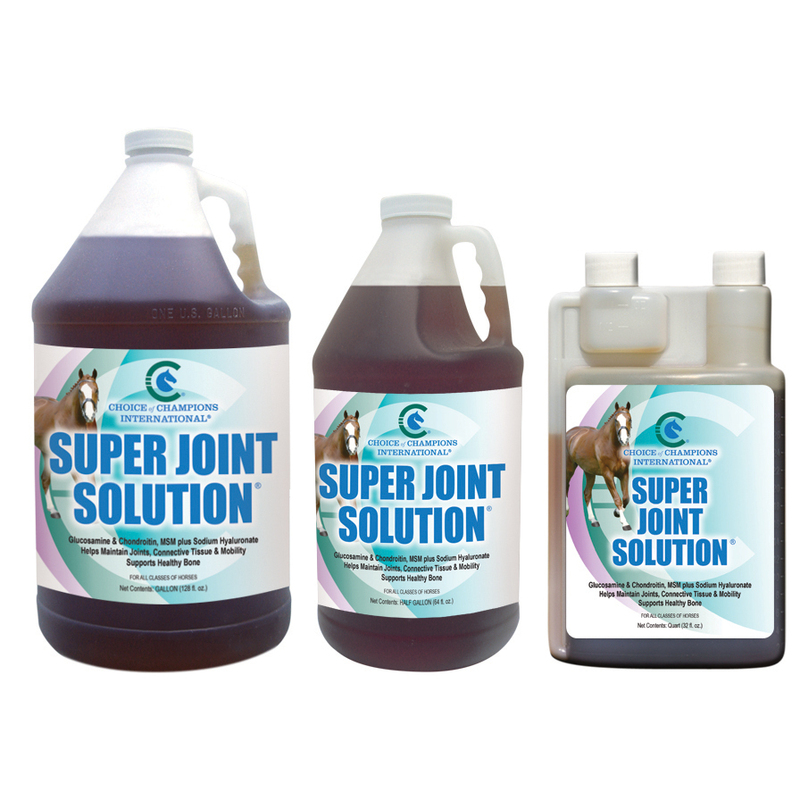 SUPER JOINT SOLUTION contains the optimal ingredients to help maintain your horse's joint health throughout the body. The quart bottle of SUPER JOINT SOLUTION has a self-measure cap. When purchasing the gallon or half gallon size of SUPER JOINT SOLUTION, please read the directions for use below and choose the appropriate size pump. Each ingredient in this easy to use formula helps provide the building blocks for synovial fluid, cartilage and connective tissue. Horses love the tasty liquid, which is specifically formulated to support back and joint function. Synovial fluid serves as a joint lubricant and maintains joint flexibility and mobility, key factors in developing equine athletes. SUPER JOINT SOLUTION is loaded with the right ingredients to help support healthy joints, starts working right away and there is no waste at the bottom of the bucket. CHOICE OF CHAMPIONS products should be stored at 40-80 degrees Fahrenheit. Extreme hot and cold temperatures and direct sunlight may cause ingredient breakdown. When properly stored, SUPER JOINT SOLUTION has a shelf life of two years. This supplement has been used in FEI competitions including the Pan American games, FEI World Cup Finals, World Equestrian Games, Rolex Three-Day Event and the Olympics, as well as USEF competitions nationwide. It is the rider and the trainer’s responsibility to stay abreast of the rule changes for the USEF, FEI and other governing organizations.